I have been running bird and wildlife courses for Adult Education since the early eighties. Please click HERE for a list of forthcoming events (now privately run). I run ‘in house’ wildlife walks and events at Kelling Heath Holiday Park, highly recommended if you fancy an outdoors holiday with a nature emphasis. I also write an occasional blog on the Kelling Heath website which you can view HERE. See Future Events for details of the free Norwich City Council nature walk and training session series I lead on Mousehold Heath in conjunction with the site warden. From time to time I run birdwatching and wildlife holidays further afield. Check on this website or contact me directly for more information. I work for other wildlife organisations too. Click HERE to see what’s in my forthcoming programme or suggest something you might like me to consider. 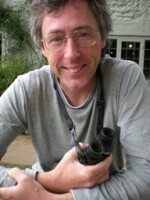 I was involved with filming for BBC Springwatch 2009, taking a dawn chorus walk and looking for adders at Kelling Heath. You may have seen me! Click HERE to read recent Eastern Daily Press article about my career and HERE to listen to episode of Radio Norfolk’s Desert Island Discs equivalent on which I featured.